When you live in a penthouse, loft, or condo in Downtown San Diego, you’re walking distance to just about everything and never want for something to do any night of the week. However, there are certain aspects of living in an urban area that can be challenging, like parking during big events or figuring out how to fit your whole wardrobe in a standard closet. Whether you just moved to Downtown or are thinking about purchasing real estate in Downtown San Diego, keep these hidden storage solutions in mind when it comes time to get creative with your space! A platform bed base with drawers underneath is ideal for smaller condos or lofts in Downtown San Diego. This ingenious storage solution maximizes bedroom space without compromising aesthetics. By adding shelving to the inside of standard closet doors, you’ll give yourself more space to store shoes, accessories, and other items that could be unorganized otherwise. Depending on the layout of your closet, you might also consider attaching baskets to the door. Unless you’re living in a Downtown San Diego penthouse, you likely could use a little more storage in the kitchen. Consider a DIY pull-out pantry with wheels that can fit in the space between your fridge and the wall. Although it won’t be too wide, it can hold canned goods, spices, cleaning supplies, or even glasses, freeing up much needed space in the cabinets. Although freestanding cabinets can work in any living area, they’re ideal for creating a ton of closed storage space and visual division in open loft spaces. 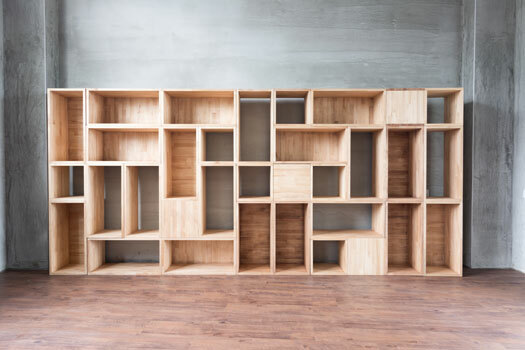 If you have empty wall space around one or more of your doorways, framing them with modular shelving adds style and more storage. This shelving can be used to display photographs, store books, knick-knacks, or pottery. This project will change the entire look and feel of your living space.